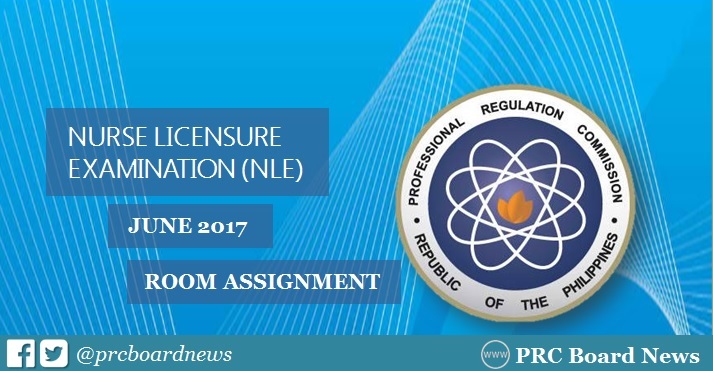 The full list of room assignment for June 2017 Nurse Licensure Examination (NLE) or nursing board exam are available on this page as officially released by the Professional Regulation Commission (PRC) Manila and all regional offices nationwide in few days before the exam. The PRC and Board of Nursing (BoN) will administer nurse licensure examinations on Sunday and Monday, June 4 and 5, in Manila, All Regional Offices (Baguio, Cagayan De Oro, Cebu, Davao, Iloilo, Legazpi, Lucena, Pagadian, Tacloban, Tuguegarao) and Zamboanga. 1. School/building assignment will be posted at the PRC premises and at the PRC website (www.prc.gov.ph) in 2 to 3 working days before the examination. Bring your Notice of Admission when you verify your school/building assignment. Visit your school/building assignment prior to the day of the examination. 2. Report to the school/building assignment before 6:30am on the first day of examination to verify your room and seat number. Be punctual, late examinees will not be admitted. a. Books, notes, review materials and other printed materials containing principles or excerpts thereof, coded data/information/formula which are relevant to or connected with the examination subject, programmable calculators, cellular phones, beepers, portable computers or other similar gadgets/devices (PRC Resolution No. 463 dated November 27, 1996). c. Other examination aides not stated on this program shall not be brought inside the examination building. 6. Read carefully and follow the instruction on your Notice of Admission. NOTE: PRC Board News together with The Summit Express will also post important updates and results for June 2017 nursing board exam.